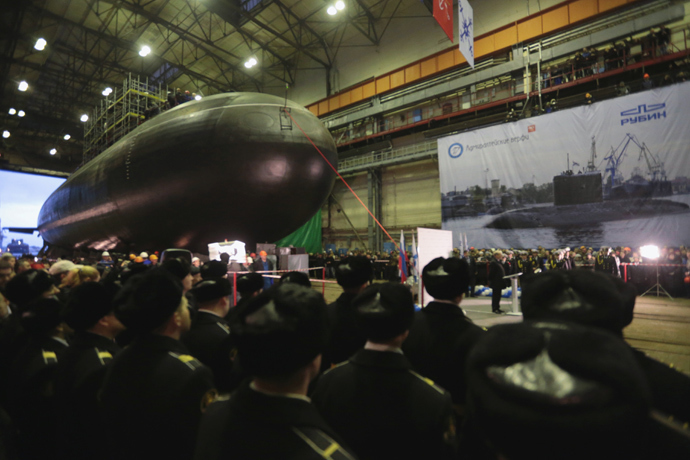 Russian Novorossiysk Diesel-Electric Silent/Stealth Submarine: New Silent Sub Creates Virtually-Undetectable ‘Maritime Black Hole’ | DefenseReview.com (DR): An online tactical technology and military defense technology magazine with particular focus on the latest and greatest tactical firearms news (tactical gun news), tactical gear news and tactical shooting news. As if U.S. Navy Aircraft Carriers and other surface ships aren't already vulnerable enough (see here and here), about a week ago, Russian Television (RT) published a piece on the Russian Novorossiysk submarine, a silent Varshavyanka-class diesel-electric stealth sub (or, low-observable sub) that's more than a little reminiscent of the ultra-silent "Red October" magneto-drive-propulsion sub in the film The Hunt for Red October. 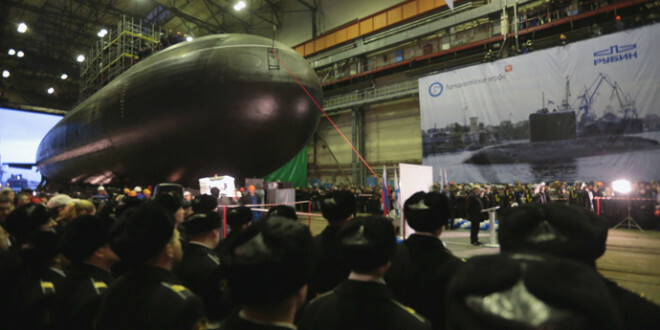 In fact, the new Novorossiysk sub is so silent, it's described as a "maritime black hole". This aquatic apparition of a sub, being "virtually undetectable", is reportedly designed primarily for anti-shipping and anti-submarine missions, but since it's equipped with eight surface-to-air missiles in addition to its 18 torpedoes, there's really nothing to keep the Russians from arming them with nuclear warheads and turning its six Novorossiysk subs into first-strike weapons against the United States and its European and Asian allies. The Novorossiysk subs top spead has been reported as 20 knots, or 37 kilometers per hour, and it has a 400-mile range on electric power. Maximum operating depth is 300 meters. The sub carries a crew of 52, can patrol for up to 45 days, and will deploy out of Novorossiysk in the Black Sea. DefenseReview (DR) has a number of questions about the Novorossiysk silent diesel-electric sub, but perhaps the most important one is will the U.S. Navy and its allies be able to detect it, and if so, how? Perhaps DARPA's future trimaran-hull "robot ship" (or, "drone ship"), the Anti-Submarine Warfare (ASW) Continuous Trail Unmanned Vehicle (ACTUV), proposed by Science Applications International Corporation (SAIC) will be able to detect it in the future. According to Aviation Week, the ACTUV sub-hunter drone will "use its onboard acoustic, electro-optical, radar and lidar sensors to acquire and follow its submarine target through high seas and periods of lost communications", and then use it's "propulsive overmatch"/superior speed and maneuverability capability to catch and stay on the target sub. DR assumes the ACTUV will work with existing sub-hunting assets like the P-8 Poseidon patrol aircraft that were recently deployed close to China. The P-8's will come in particularly handy now that tensions between China and Japan have flared up. Let's just hope China and Russia don't team up against NATO. That could prove to be a real problem. Next: XFC UAS (eXperimental Fuel Cell Unmanned Aerial System) from NRL: Quiet, Stealthy and Submarine-Launched!